For Roman Catholics every pope is infallible in his teachings, even if the incumbent takes a sharply different view from his immediate predecessor. In Pope Francis, the current bishop of Rome, that observation is certainly true when it comes to the Christian church’s relationship with Islam. The Argentinian-born prelate draws sharp contrast to Pope Benedict, the retired Pope emeritus, when addressing this important relationship. In his upcoming three-day visit to the UAE in February, Pope Francis is expected to double down on his promotion of tolerance and understanding between Christians and Muslims, a continuation of his outreach to Muslim communities around the world. During a visit to Egypt in 2017, Pope Francis was clear on the need to stand up to extremism. He condemned the “idolatrous caricatures of God” that underlies violent ideologies. When Basir Jamil was 8 years old in 2001, he hated the terrorists who destroyed the World Trade Center, smashed into the Pentagon and downed an airplane full of people in rural Pennsylvania. So when he was called the same thing—a terrorist—a few years later in middle school, he was shocked. Basir, now a senior at C. Milton Wright High School in Bel Air, Md., says he hears fewer insults directed at him or other Muslim students today. But he knows that’s not the case for thousands of other Muslim kids across the country. “People should have the right to speak out, but they should be more educated before they say something,” says Basir, 17, whose parents are from Pakistan. The Islam he has been raised with is a peaceful religion, he says. America’s 2.5 million Muslims make up less than 1 percent of the U.S. population, according to the Pew Research Center. Anecdotally, we know that many Muslim students face discrimination. Unfortunately, no group or government agency keeps statistics on the subject. But some cases have warranted investigation by the U.S. Department of Education’s Office of Civil Rights. Muslim groups have reported widespread bias as well. The Islamic Networks Group is a San Jose, Calif., nonprofit that promotes education about Islam. In recent years, the group has spoken with Muslim students about what they were experiencing. Content Director Ameena Jandali says her organization wanted to know if the students’ beliefs had made them targets for taunts and bias. “We were shocked to see it was happening on a regular basis,” she says. Jandali says news stories frequently trigger anti-Muslim incidents. In recent months, those stories included the controversy over a Florida preacher threatening to burn Qur’ans and the uproar that followed plans to build an Islamic center near the World Trade Center site in New York. Jandali says just about any anniversary of September 11 also heightens the tension for Muslims. ISTANBUL — Over the past decade, headlines from the Middle East have reintroduced Westerners to terms from centuries past. “Heresy,” “blasphemy,” “apostasy” — these are some of the charges that the radical Salafist group known as the Islamic State invokes when it executes its enemies, sometimes by crucifying or burning them alive. Some Muslim governments, including United States allies, also mete out harsh punishments for similar offenses. The liberal blogger Raif Badawi was publicly flogged in Saudi Arabia last month on a charge of heresy, which he allegedly committed by criticizing the oppressive Saudi religious establishment. Although there are contextual differences for these practices, as well as the sanctions for religious offenses in Iran, Sudan or Afghanistan, they all share one fundamental objective: Punishing people in the name of God. A 2013 poll by the Pew Research Center showed that while not all of the world’s 1.6 billion Muslims approve of this notion, a significant proportion of them do. Majorities in Egypt and Pakistan, for example, support the death penalty for Muslims who dare to abandon their religion. Looking at this, some Westerners conclude that Islam is inherently more rigid than the creed that has defined their own civilization: Christianity. But they are forgetting that Christianity had its own, no less violent, history of punishing in the name of God. 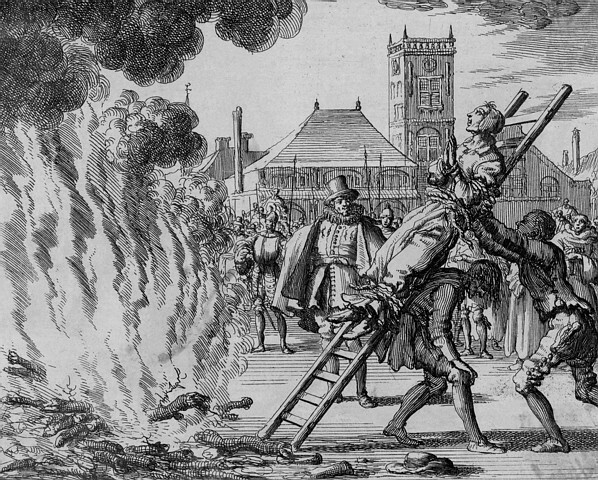 For centuries, churches burned people they thought were heretics at the stake or tortured them to purify their souls. The main difference with Islam is that Christianity gradually outgrew that age of religious persecution by grounding its theology in tolerance, reason and liberty.